Barbara is a 73-year-old Kingston, ON resident who lives with osteoarthritis. Her condition results in poor balance and makes walking difficult. For over eighteen years, Barbara has been using a walker to help keep her mobile. Over time, the walker began to break down. However, she needed this equipment, so Barbara continued to use it, even without brakes. 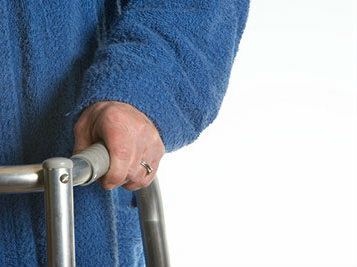 The condition of her walker was so poor that she could not even venture into the hall of her apartment building safely. Barbara said that “my old walker made me feel nervous when I was moving around.” Barbara’s occupational therapist began to worry about her safety and urged her to buy a new walker, but her limited income made this a difficult task. Barbara, in need of help, turned to March of Dimes’ Assistive Devices Program. The Assistive Devices Program (ADP) provides financial assistance to people with disabilities across the province, assisting with the cost and maintenance of basic mobility devices as well as home and bath safety equipment. ADP is one of March of Dimes’ charitable programs supported 100% by donor dollars. Many of the people served live on an income of less than $15,000 per year, meaning that many assistive devices are financially out of reach. At ADP, the program is able to stretch every dollar to its fullest potential enabling staff to provide necessary, life-changing devices to people across the province that so desperately need them – and cannot afford the equipment on their own. United Way donates a portion of its funds to the ADP program in Kingston and focuses on promoting Healthy People, Strong Communities. Without United Way, March of Dimes would be unable to continue helping people like Barbara. Without this partnership, the expense of a new walker, which exceeded $500, would have prevented Barbara from the peace of mind she now enjoys. Barbara is happy to have her new, safe walker. Although she uses it primarily for indoor use, Barbara prefers using her walker over her wheelchair so that she can maintain and build strength in her legs. Without the funding she received from March of Dimes, Barbara said she “would have had to keep her old walker and she would have had to use her wheelchair more often.” The new walker is large and comfortable enough to allow Barbara to sit on it when she needs to, which allows her to use it over her wheelchair. Barbara is very thankful for the help she received from March of Dimes. The L.I.F.E. Toronto group at March of Dimes Canada has teamed up with Canadian Music Therapy Trust Fund to add an exciting new component to L.I.F.E. program. Jess explained that she has always LOVED music however she never had the opportunity to participate in music in school. She was nervous for the first day of music therapy but that quickly changed to excitement and laughter. The entire group agrees that Rebecca, the music therapist, is so much fun to be around and incredibly encouraging. She is always telling us how well we played instruments and compliments us when we sing along with the song. We play a variety of different instruments such as drums, tambourines and shakers along to some of our favourite songs. When we sang Firework by Katy Perry, Rebecca had us choose colours that we wanted to incorporate into the song. All of the colours were written on cards. This made it really easy to point at which colour we wanted to sing about. For other songs like Stompa by Serena Ryder, Rebecca had us take turns choosing a sound or movement to incorporate into the song. Jess loves music therapy because she finds it helps relieve some of the stress she experiences in a day. Evan enjoys the opportunity to practice using his hands and arms while playing the instruments and Sraddha finds that it helps with communication. This spring the L.I.F.E. group is extremely excited to make a song of their own in Music Therapy and to share it with all of you when it is complete! L.I.F.E. Toronto program continues with the support of United Way Toronto, TD Canada Trust, Toronto Community Foundation, and Royal Bank.